I am going to leave you with another photo today.....my son who is high school junior made it to State for his swimming this year. He made it in the 50 free which is an individual event as well as being a member of two relays. 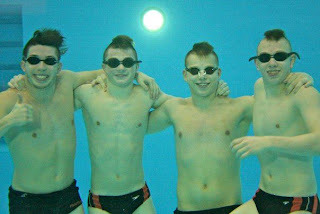 Here is an underwater photo of the boys as they prepare to leave for the state competition. My son is on the far left giving the "thumbs up" motion. It's just a cool photo I think! Good luck on the state competition! How proud you must be! Your card is so adorable and I can imagine how fun that was to color the image! great photo of your son and his swim mates. And your froggie card is adorable. Sheila this card is "hopping" cute. Great colors. That water photo is so cool. Congrats to your son! Adorable frog!! How did I miss this? ?